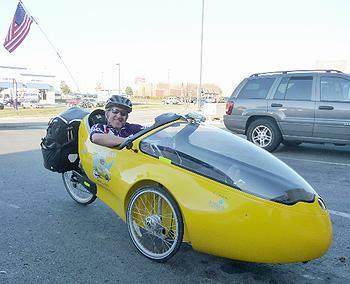 PORT ARTHUR, Texas, December 22, 2011 (ENS) – Tom Weis arrived Wednesday in the refinery town of Port Arthur, after pedaling his “rocket trike” 2,150 miles along the proposed U.S. route of TransCanada’s Keystone XL pipeline. One of the first people to be arrested this summer at the White House protesting the pipeline proposal, Weis undertook his 10-week-long journey to warn U.S. residents along the route of the dangers of bringing heavy tar sands oil from northern Alberta to refineries on the Texas Gulf Coast. “The most difficult part of this journey was witnessing first-hand how this foreign corporation has turned peoples’ lives upside down and caused them so much pain and anguish,” Weis told ENS in an interview. “Because of this toxic tar sands proposal, hardworking Americans, ranchers and farmers who live on the Great Plains have had to dedicate themselves to fighting this transnational corporation to protect their families and protect their water,” said Weis. Weis is critical of President Barack Obama, who must decide whether or not the Keystone XL pipeline is in the the national interest. “The number one job of the President of the United States is to protect America and the American people. Transcanada’s proposed pipeline is a direct threat to the American people and he is failing at his job,” said Weis. Because the pipeline would cross the U.S.-Canada border, a Presidential Permit issued by the U.S. Department of State is required for the project to proceed. But questions have been raised about a conflict of interest that arose when the State Department commissioned Cardno Entrix, a Houston-based environmental consulting firm that considers TransCanada a “major client” to help prepare the pipeline’s EIS and now maintains the department’s Keystone XL website. The question of whether the State Department’s environmental review to date has been honest will be investigated by the State Department’s Office of the Inspector General. On November 10, the State Department ordered a supplemental environmental assessment for the TransCanada Keystone XL pipeline route, allowing President Obama to defer the contentious issue until after the 2012 elections. Meanwhile, the state of Nebraska, concerned that the proposed pipeline route crosses the environmentally sensitive Sand Hills region overlying the Ogllala aquifer, has prevailed on TransCanada to change the route. However, nothing is resolved. 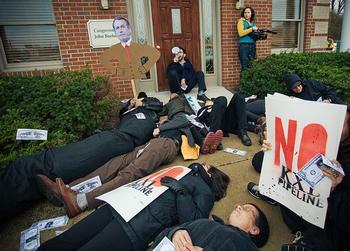 This week Congress has been kicking the Keystone XL pipeline around like a political football. On Tuesday, House Republicans rejected a tax-relief bill passed by the Senate that would have forced the Obama administration to make a decision on the Keystone XL pipeline within 60 days, creating more uncertainty over when a final ruling will come. If Congress does not act, the Keystone XL pipeline permit issue will wait until early 2013, the timeline set by the U.S. State Department. Weis is among the environmentalists who see this maneuvering as more political game playing inside the Beltway. In Houston on Tuesday, Weis spearheaded a mock-holiday demonstration in front of TransCanada’s Houston, Texas headquarters. Twelve pipeline fighters lined up in front of the building and, one by one, opened gift boxes containing 12 of “the most egregious lies and abuses TransCanada is giving the world through their proposed Keystone XL pipeline and tar sands exploitation,” blogged Weis. “Here are the 12 Disgraces (in no particular order): 1) Toxic Tar (not oil), 2) Ecocide, 3) Human Rights Abuses, 4) Eminent Domain Abuses, 5) Lies about Jobs, 6) Lies about Energy Independence, 7) Pipeline Leaks, 8) Polluted Water, 9) Environmental Injustice, 10) Climate Chaos, 11) Higher Fuel Prices, and 12) Undermining the Green Industrial Revolution,” he blogged. 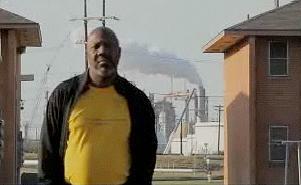 On Wednesday, “overshadowed by the nation’s largest cluster of oil refineries and chemical plants” Weis met with a group of West Port Arthur children who 2011 Goldman Prize winner Hilton Kelley, a native of Port Arthur, had brought to learn about the Keystone XL pipeline and see the rocket trike. Weis describes himself as “a social change agent” with 25 years of environmental and political organizing experience. He is president of Climate Crisis Solutions, an environmental consulting firm based in Boulder, Colorado. Weis has worked for years in the wind energy industry, serving as strategic advisor to the president of the Board of the American Wind Energy Association. He received AWEA’s 2009 Special Achievement Award for his role in creating the American Wind Wildlife Institute. He helped create the Colorado Renewables and Conservation Collaborative, and, from 1996-2003, served as national field director of Public Employees for Environmental Responsibility.